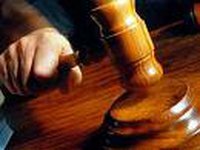 Kyiv Court of Appeals has released former head of the State Customs Service Anatoliy Makarenko and former Deputy Head of the Energy Regional Customs Service Taras Shepitko from custody. The court thus satisfied a petition from their lawyers at a court session on Tuesday. A panel of judges decided to change the measure of restraint against Makarenko and Shepitko from detention to a travel ban. In particular, they have been banned from traveling outside of Ukraine until the court completes the trial. In their petition, the lawyers noted the deteriorating condition of Makarenko. "The man is on the verge of a heart attack," they said. In addition, Makarenko said that he had progressing ischemia, his teeth had begun to fall out and that his vision had deteriorated. "I don't understand why, instead of actively using me in the process, I'm being destroyed... I guarantee my perfect procedural behavior to you [the judges in case of my release from custody], Makarenko said. At the same time, the court refused to release former First Deputy Chairman of Naftogaz Ukrainy Ihor Didenko from custody. As reported, on April 26, 2011, the Pechersky District Court of Kyiv sent the case against Didenko, Makarenko and Shepitko to the Ukrainian Prosecutor General's Office (PGO). The court announced its decision after considering an appeal by the accused requesting the return of the case to the PGO so as to change the sentence, due to the opening of a criminal case on the 2009 gas contracts against former Ukrainian Premier Yulia Tymoshenko by the Prosecutor General's Office. The court explained its decision by the fact that "the same events and conditions" are being investigated in the criminal cases against Didenko, Makarenko and Tymoshenko. The Arbitration Institute of the Stockholm Chamber of Commerce obliged Naftogaz on June 8, 2010 to return to RosUkrEnergo 11 billion cubic meters of gas and also pay it a penalty of 1.1 billion cubic meters of gas, as stipulated by the contract. The Ukrainian Security Service completed its pre-trial investigation into a criminal case against the Naftogaz of Ukrainy and the State Customs Service officials charged with misappropriating gas belonging to the Swiss-based gas trader RosUkrEnergo and its illegal customs clearance in February-March 2009. The Security Service believes the investigators had gathered enough evidence to prove the defendants' guilt. Didenko, Makarenko, and Shepitko have been arrested under this case. The Ukrainian Prosecutor General's Office opened a third criminal case against Tymoshenko in April this year, this time around on charges of abuse of office in concluding the gas contracts with Russia in 2009, which, according to the investigation, caused damages amounting to UAH 1.5 billion to the state.